We have been so excited about the arrival of this foal from the first crop of the mega moving young stallion Revolution and this filly has exceeded our expectations! She is everything we dreamed of and more, she is tall, elegant, with 3 powerful paces and she simply exudes class. Of course her amazing sire is only half of the equation, her dam Elite & State Premium mare and stallion mother Show Hit is already creating her own dynasty and this young filly is a very worthy addition. 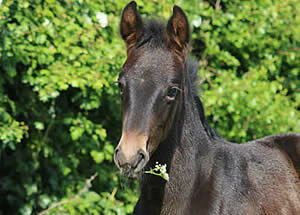 This filly is totally enchanting and casts a spell over everyone she meets, so we just had to call her Spellbound!! This exceptional filly has a very exciting future ahead of her. Congratulations to family Tottman on having the foresight to purchase this filly in utero, we wish you a very happy and successful future with her! With a winning bid of €1.2 million, Revolution broke the record for all German stallion auctions at the Hanoverian licensing in Verden in the autumn of 2015. The sold-out Niedersachsenhalle celebrated the "Million-Dollar-Baby" with a standing ovation. High-set, elegant and with three fantastic basic gaits and a wonderful temperament, he is an ideal modern sports horse. He was awarded a premium at the Hanoverian and DWB licensing's and won his 30-fay performance test in 2016. He is a young stallion, only a four-year-old in 2017, but has looked spectacular at the Spring stallion shows and we will eagerly await his debut in competition. Revolution's sire, the premium stallion Rocky Lee, is proving himself in his breeding career with winning offspring. Rocky Lee by the top stallion Rock Forever, who is already an established name in international horse breeding owing to top quality progeny. Rock Forever, granted the NRW suffix by the German Federation, competed at grand prix himself before retiring to stud. He descends from the jumping lines of Ramiro Z and Landgraf I, adding strength and athleticism into Revolution's pedigree. His dam Rochelle is by the powerful Holsteiner sire Rouetto, who is known for his cross over ability in breeding, producing top dressage horses as well as jumpers. The dam sire of Rochelle is the Hanoverian Wendenburg (1975) who was a good producing stallion, being by venerable Wendekreis. Revolution is his dam Rochelle's first foal. With her thoroughbred maternal bloodline mixed with well-reputed Hanoverian blood through the stallions Wendenburg and Derneburg, she meets all pedigree criteria for a modern dam of stallions.